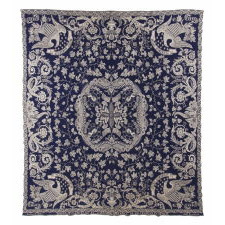 Coverlets are loom-woven bedspreads. 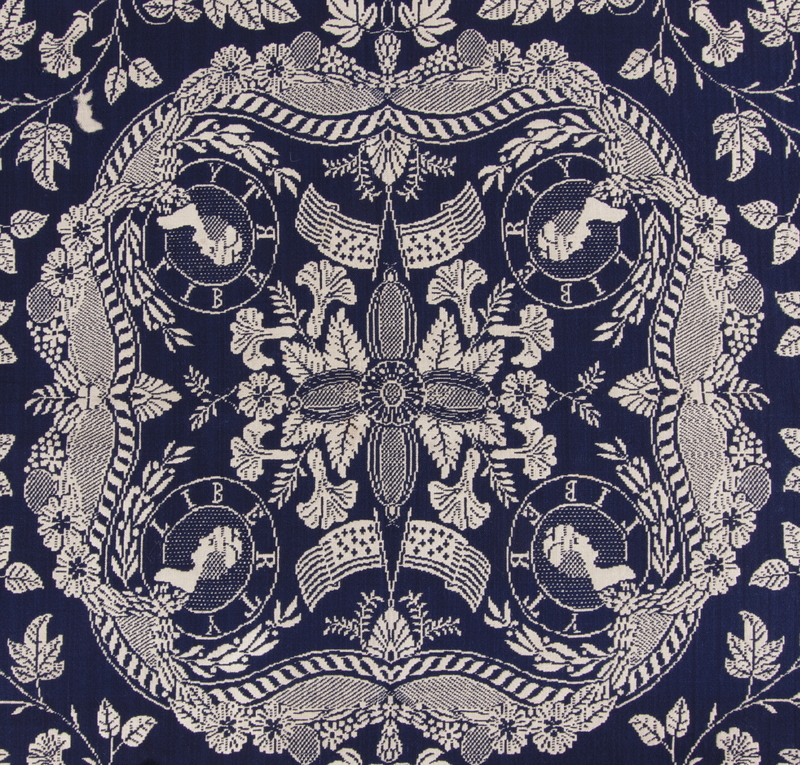 Unlike quilts, which are pieced from commercially produced fabrics, coverlets are painstakingly created from the ground up, so-to-speak, woven line-by-line. 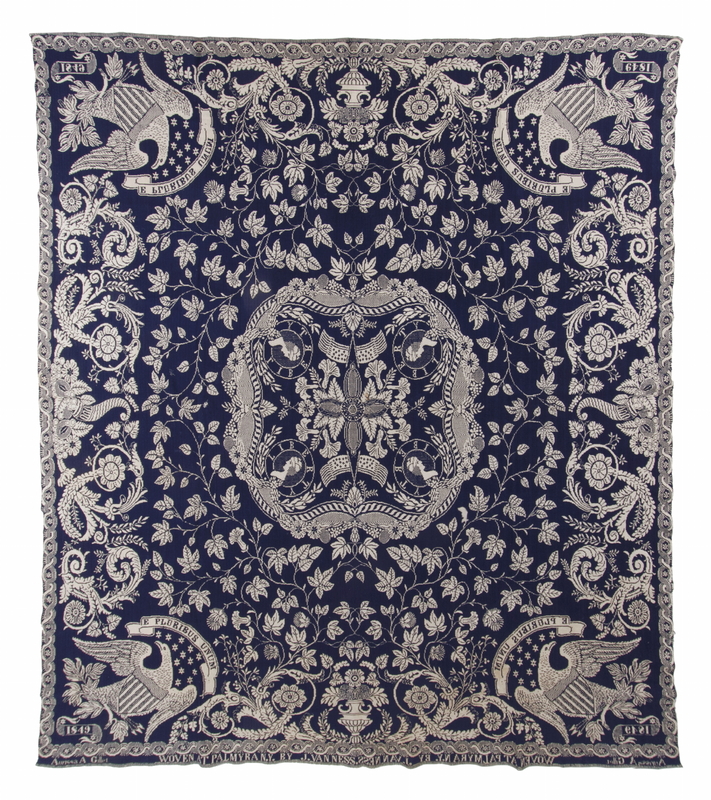 In America, many are jacquard-woven, Beiderwand textiles, the latter meaning that they are simultaneously made in two layers, one light and one dark, that mirror image one-another on the obverse and reverse. 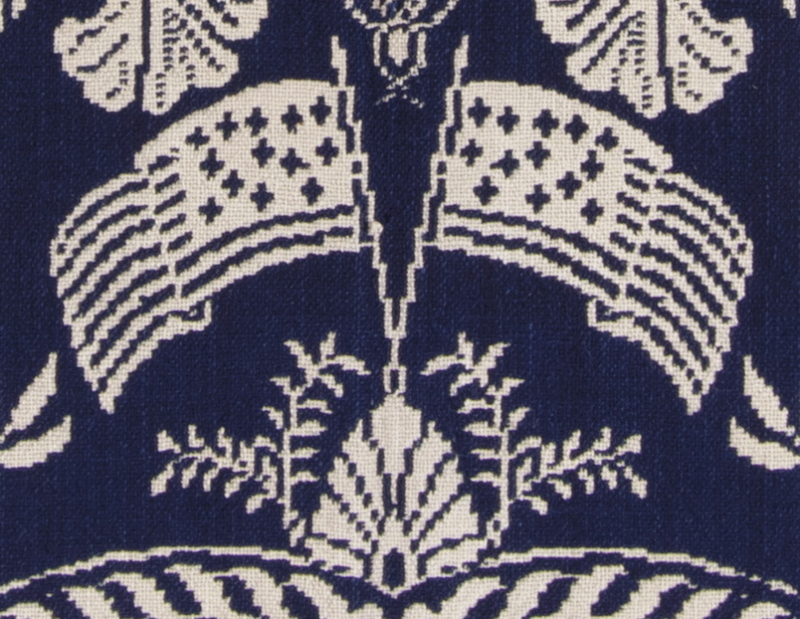 The resulting coverlet has what has been commonly termed a "summer" and "winter" side rather than having a front and back. 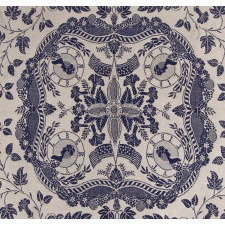 Dated coverlets began to appear in the early 1770's and were made through approximately the 1880's, though the most commonly occurring dates fall within the 1830-1850's era. 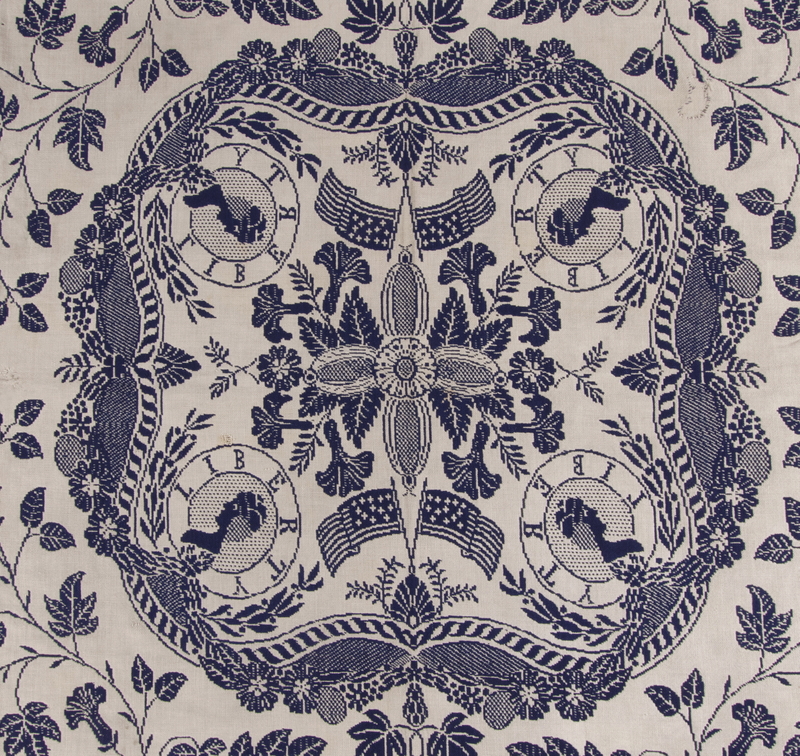 There were two basic genres, geometric and what is known as "figured and fancy." The latter of these regularly included floral elements, animals, buildings, and people, as well as text. Despite modern preconceptions, these were almost exclusively woven by men. 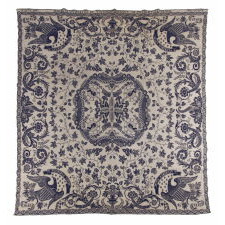 Coverlets come in so many different forms that one could never hope to encounter them all. 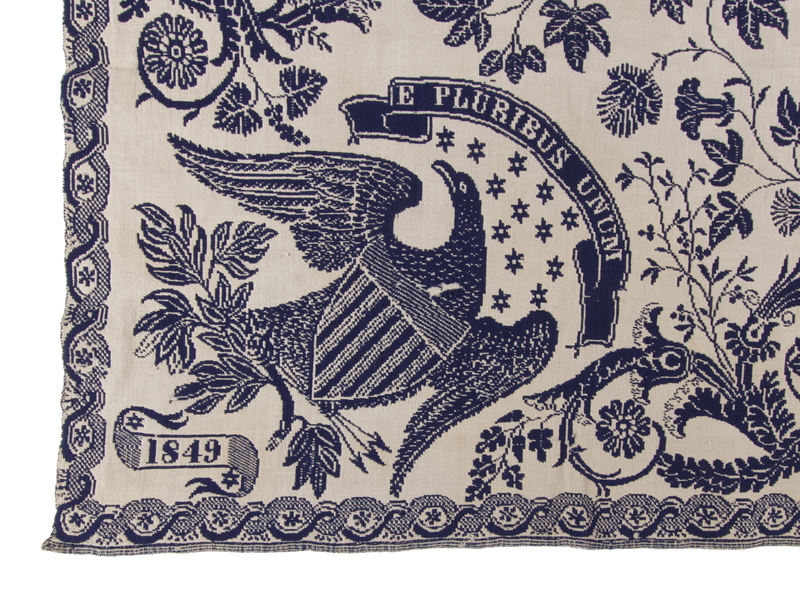 Some had patriotic imagery, which causes them to bridge categories in antique collecting. Many can be traced to certain areas of the country by dyes and other traits. The example presented in this write up is a extremely scarce. 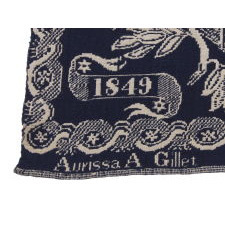 Made in Palmyra, New York, both the date, "1849," and name of the maker, "J. Vanness" [James Vanness, 1811 - 1872], are recorded in the weaving itself, along with the name of the person for whom it was made, Aurissa A. Gillett. 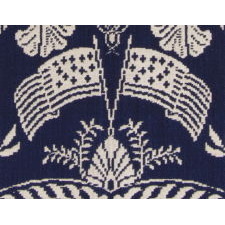 Two-color, blue-and-white coverlets, such as this one, can often be traced to Wayne County, New York and the Palmyra area. 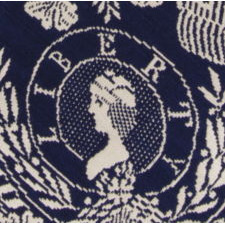 While other color combinations were produced here, blue and white examples are often Palmyra specific. 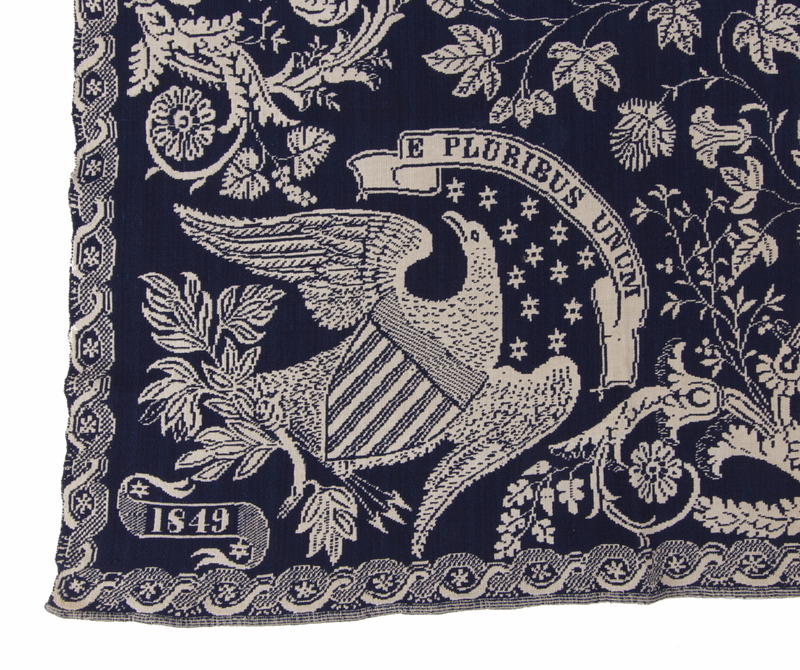 The design of this coverlet features a medallion with flora and fauna at the very center, at the top and bottom of which are crossed pairs of 13 star American Flags on staffs. These appear in a 5-3-2-3 configuration, which is a very rare layout for this star count. 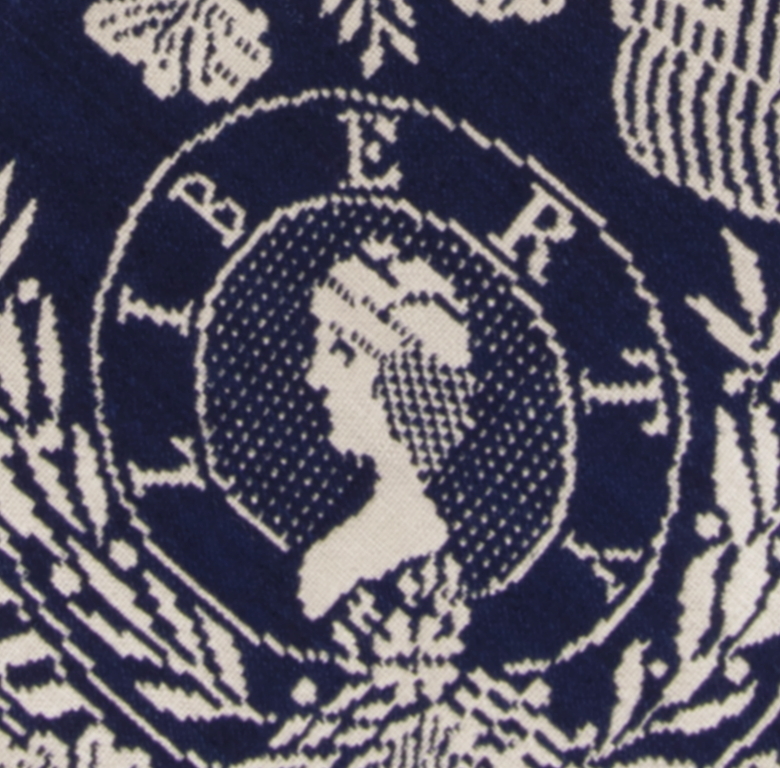 Flanking in each corner are depictions of a Liberty head coin, cradled by laurel leaves. 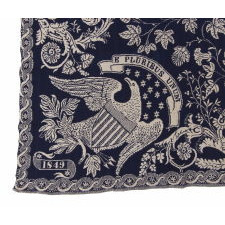 These mimic the $2.50 gold piece and penny of that era, both of which appeared in 1840 and were in use at the time in which the textile was made. A scrolling rope border forms the perimeter of the central window, decorated all around with a garland of flowers and fruit. 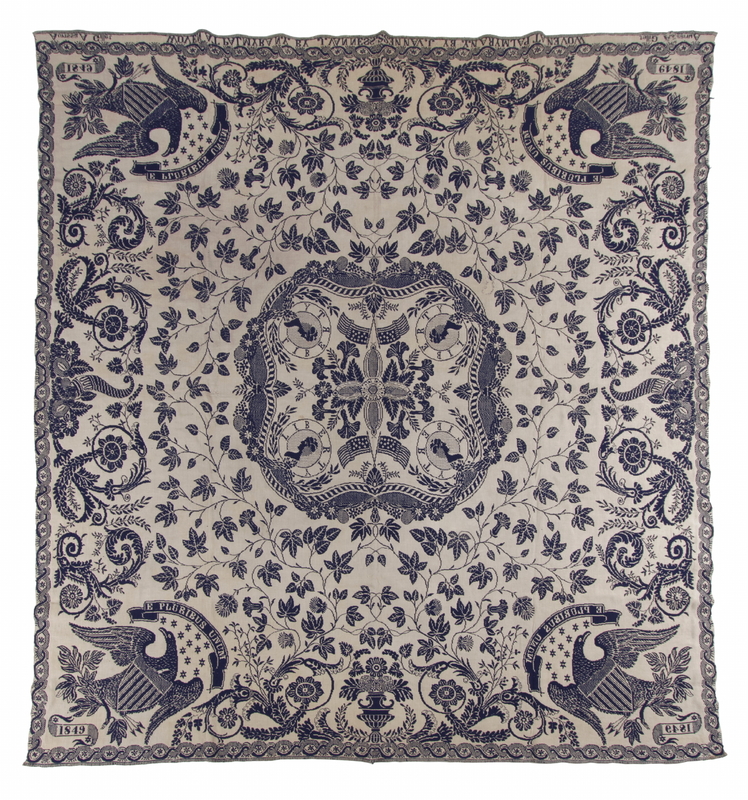 The background and wide border of the coverlet are consumed by a myriad of more flora and fauna. At the top and bottom are urns and to the left and right, cornucopia. 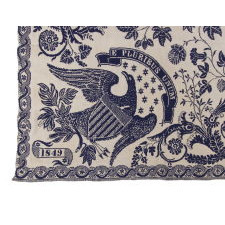 Large, stylized depictions of the Great Seal of the United States flank each corner, featuring especially attractive federal eagles, with one wing outstretched, beneath an array of13 stars. Beyond these are fanciful scrolls with stars and the date. Around the outer edge are 6-pointed flowers or stars set amidst braided rope or vines. 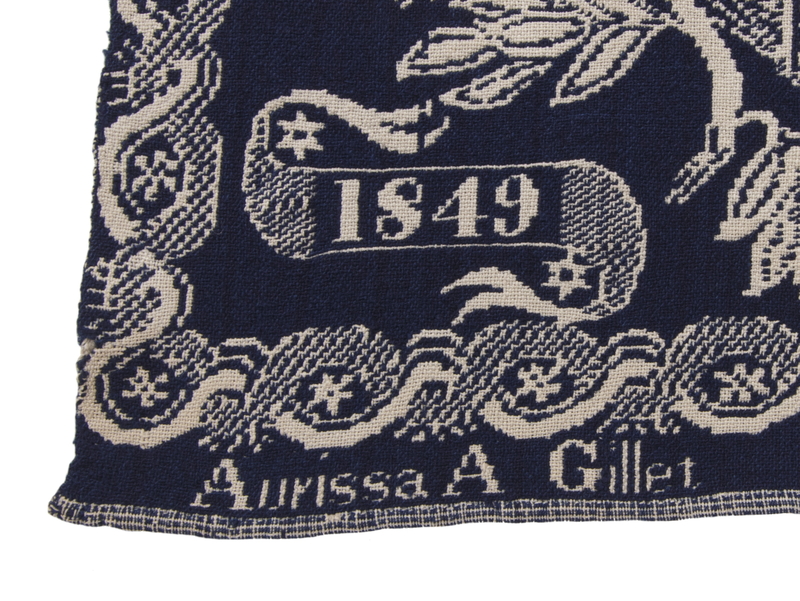 The name of the recipient of the coverlet, maker, and location are along the lower edge. 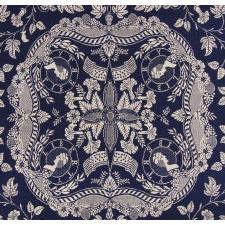 Examples of this coverlet are among the holdings of three institutions, including the Museum of American Folk Art, in New York City (a blue version, made for Thankful Boyce by Ira Hadsell in 1853), the Art Institute of Chicago (two copies, one in blue, made for Sarah E. Cornwell by Ira Hadsell in 1855, and one in red, made for Cyrene A, Wells by J. Vanness in 1849), and the Alling Coverlet Museum in Palmyra (2 copies, one in blue, made for Christina Germond by Ira Hadsell in 1852, and one in red, made for Elizabeth T [illegible] by Ira Hadsell in 1852). 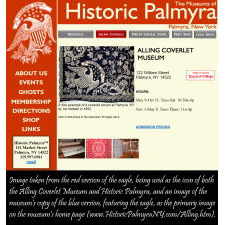 A depiction of the eagle from the red version actually serves as the icon image for the town of Historic Palmyra, while a close-up of the corner of the blue version, with the eagle, appears as the primary image on the Alling Coverlet Museum's own home page (http://www.historicpalmyrany.com/allingintro.htm). 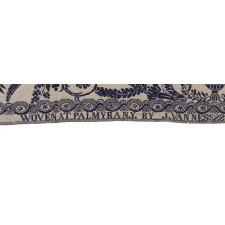 From the information above, it would appear that weaver James Vanness was probably the first to pursue the Liberty design, and that it was sold or transferred to, or copied by Ira Hadsell sometime thereafter. All-in-all, an exceptional example of the form.